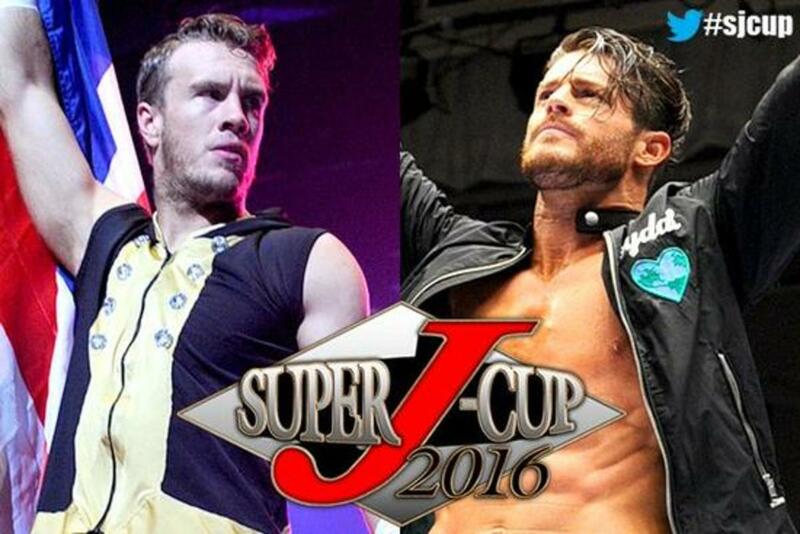 The 2016 Super J-Cup crowns its winner on Sunday morning with the tournament finals airing live on NJPW World from Tokyo, Japan. Going into the show, Jushin Thunder Liger, Taichi, KUSHIDA, Kenoh, Ryusuke Taguchi, Yoshinobu Kanemaru, Matt Sydal, and Will Ospreay are all still alive in the tournament. The card will feature second round matches, semifinal matches, and the tournament final. And the show will also feature notable appearances from competitors outside of the tournament, as The Young Bucks defend their IWGP Junior Heavyweight Tag Team Championship against familiar rivals in the Motor City Machine Guns. The GHC Junior Heavyweight Tag Team Championship will be on the line as well, with Atsushi Kotoge and Daisuke Harada defending against ACH and Taiji Ishimori. And the show will feature CMLL stars as Volador Jr., Titan, and Caristico take on Ultimo Guerrero, Gran Guerrero, and Euforia in a six-man tag. Okay match. Eita, Gurukun Mask and Aoyagi did some cool dives at the end. Bushi pinned Finlay coming off the top rope with a codebeaker. After the match, Bushi turned on his teammates, blowing mist in Tomato's eyes after Tomato offered him a tomato, and then Bushi started tearing up Gurukun's mask. Nothing to this match. Desperado kept interfering. It ended up on the floor in the aisle with Liger fighting with Desperado and Taichi. Taichi kicked Liger and Desperado just held Liger on the ground while Taichi ran in to beat the count and win via count out quickly. Taichi had his girl with him who was hitting on Liger before then making out with Taichi. After the match Liger hurled a chair at them and hit Desperado right in the from far away and he went down selling the knee and limped to the back. This was an excellent technical match. If you're into top level matwork this was it. But a big issue today is that the crowd is small and because of that it doesn't have the big event feel. They exchanged moved and submissions on the mat with Kushida constantly going for the hoverboard lock until getting the armbar in the middle for the submission. This sets up Kushida vs. Taichi next. This was good, but lacked heat which is looking like the theme of the show. Kanemaru kicked out of the Dodon and Taguchi kicked out of a DDT off the top rope but Kanemaru followed that up with his touch out, which is a brainbuster for the clean pin. Kanemaru is the GHC jr. champion so he figured to not get eliminated here. In an upset, Sydal pinning him clean with a shooting star press after a reverse Frankensteiner off the middle rope. Athletically, this blew away anything this week but this is just not a crowd where you can be in the match of the year because they were so quiet, although in the end you could see they really liked it. There was an awesome high spot early. Ospreay did the Space Flying Tiger drop and a lot of things that were blow away like Sydal giving Ospreay a lariat and Ospreay doing a spin bump and landing on his feet. It wouldn't be my call to beat Ospreay here. Very good match and the crowd appreciated it but didn't go wild for it. It was almost exactly what you'd think. The first several minutes of heel heat saw nobody care because there was no interest in personalities or storyline. Once they did the first sequence of dives the crowd was into it. Caristico is nowhere near 100% due to a broken pelvis and he was the big star from his days as Mistico. Titan and Volador were great and the heels did their jobs. The biggest reaction was Volador doing a big plancha into a hurricanrana. Caristico kicked out of the Guerrero special. Volador pinned Gran Guerrero after a top rope Spanish fly. This was pretty much their Friday night Arena Mexico match but without the intense fan reaction. Taichi attacked him before the match with the mic stand. At one point Kushida made a comeback and was on the top rope for a dive to the floor, Taichi's girl got in front of Taichi so he wouldn't dive. Taichi used the ring bell and played heel and got good heat. Kushida came back with the hoverboard lock but Desperado distracted the ref who missed Taichi furiously tapping. Taichi hit Kushida in the head with a chair and used the Gedo clutch for a strong near fall. Kushida also kicked out of a last ride power bomb and scored the pin with a spinning move into a cradle. After the match Taichi and Desperado attacked him again. Good back and forth match. You can tell they were going forward with a champion vs. champion finals results since Kanemaru is the current GHC junior champion. Sydal tried for the shooting star press but Kanemaru got the knees up, smashed him with a lariat and picked up the win to go to the finals. Pretty good match. ACH in particular looked strong here and should be a regular in NOAH going forward as he could definitely be a new bright spot in that division. Cool spot at one point was ACH and Ishimori hitting stereo 450 splashes, but both Kotoge and Harada got the knees up and cradled them for a double near fall. Kotoge and Harada isolated Ishimori and pinned him after a bridging German suplex by Harada. After the match, the champions called out Gedo & Jado. Jado came down to the ring, and Gedo left commentary to accept their challenge. Guess them getting a win on the G1 finals card made sense in the end. This was really good, one of the better matches of the night but the crowd, which was cold for a lot of the show, was just there. Bucks were wearing gear with Dave Meltzer’s face plastered all over. MCMG looked good, as did the Bucks. Lots of great back and forth sequences towards the end. The Bucks laid out Shelley on the outside with an Indytaker, then pinned Sabin after hitting the Meltzer Driver. Bucks got on the mic after the match and said they have won the IWGP Jr. tag team championships, but they want to do something that has never done before - they challenged the Briscoes, who hold the heavyweight tag team titles. If this is the next step toward unifying these two divisions, I’m all for it. Pretty good match, but again the crowd was just there and didn’t feel like a big tournament was concluding, or that two junior world champions were going at it. Taka Michinoku got involved, pulling the ref out of the ring at one point. KUSHIDA fought off the brainbuster attempts by Kanemaru. Taichi also got involved but Taguchi thwarted him. KUSHIDA got in the hoverboard lock and Kanemaru tapped. KUSHIDA was awarded the golden jacket as Alex Shelley, his former tag team partner (I guess it’s former for right now) helped him put it on. They shared a nice moment as everyone came out and posed for a group picture to close out the show.